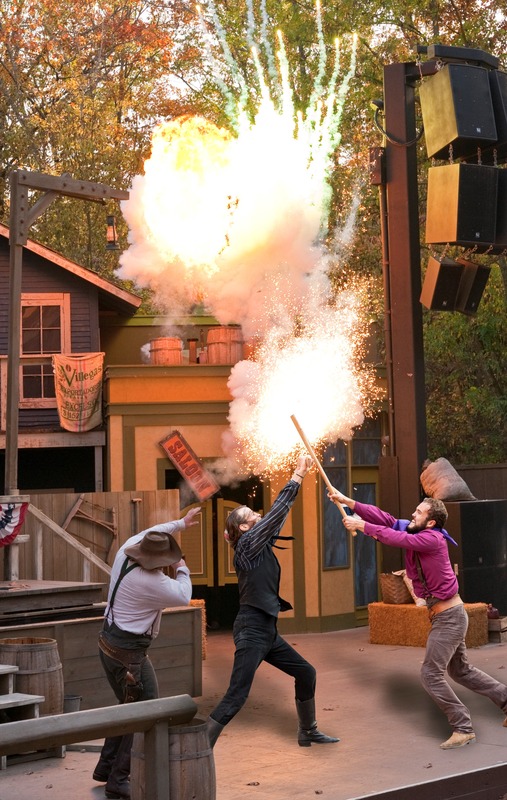 Silver Dollar City presents a new high-action Wild West Show, the return of a stunt-packed Western stunt show, top craftsmen from around the country and live bands, all part of the National Harvest & Cowboy Festival, September 12 - October 25. The adventure-loving culture of the Great American Cowboy and the best elements of the classic West flavor the fall harvest features as Silver Dollar City presents a new high-action Wild West Show, the return of a stunt-packed Western stunt show, top craftsmen from around the country and live bands, all part of the National Harvest & Cowboy Festival. The Ozarks’ leading fall festival famous for fine craftsmanship and fall harvest activities runs September 12 – October 25 at the Branson, Missouri theme park. A major focus during the National Harvest Festival is craftsmanship, as the park features 125 top craftsmen from around the country, including Best of Missouri Hands juried artists and a showcase of Western artists, all joining the 100 demonstrating craftsmen of Silver Dollar City. Featured festival crafts include weaving, jewelry making, stained glass, basket making, gourd carving, leather crafting and painting. For its five-decade presentation of craftsmanship, Silver Dollar City was named “The Home of American Craftsmanship” by the U.S. Congress. Legendary Western star and water color artist Buck Taylor returns, hosting “Buck Taylor’s Cowboy Emporium” featuring a variety of Western crafts from water color to saddle making. Western and bluegrass musicians perform in the Riverfront Playhouse, including Nothin’ Fancy, Horse Crazy Cowgirl Band and The Bankesters. Chuck wagon historian and chef Kent Rollins, a cattle rancher and chuck wagon cook whose talents have landed him on the Food Network’s “Chopped,” “Throwdown with Bobby Flay,” and the new show “Food Fighters,” demonstrates trail-side cooking. Extreme Mustang Makeovers’ mustang expert Fred Woehl tames and trains rescued wild mustangs during the festival. 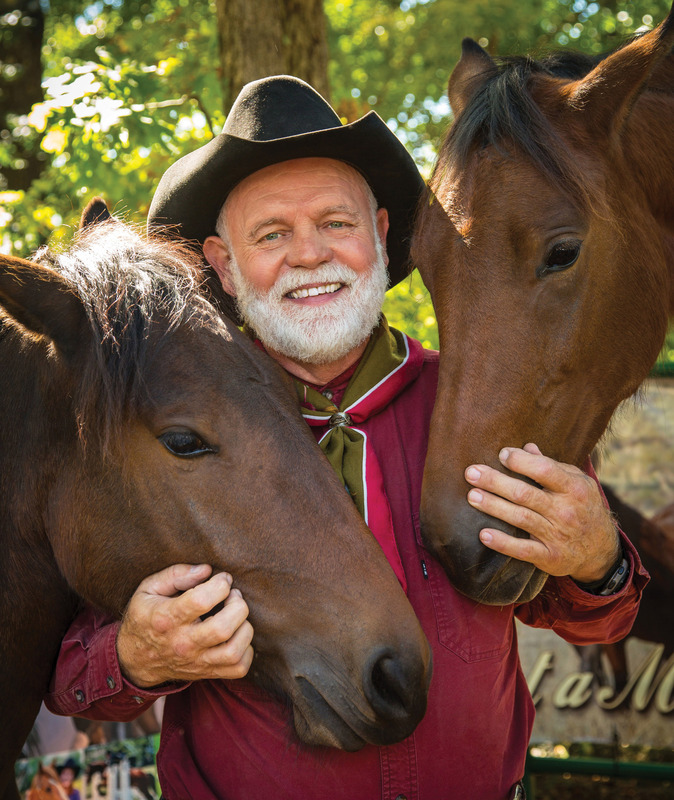 A horseman with 35 years’ experience training horses, Woehl serves on the National Wild Horse & Burro Advisory Board. The Barn Dance returns with an open dance floor for guests to strut, slide and stomp, with live music by the Horsecreek Band. Fall harvest activities from sorghum and apple butter making are demonstrated on the Square and harvest-time foods are served up throughout the park, with favorites such as homemade soups and stews, smoked turkey legs and hearty skillet meals cooked on open grills. The Midwest Living Culinary & Craft School will feature fall recipe classes from fall favorite comfort foods to iron skillet cooking. The National Harvest Festival runs September 12 – October 25 at the Branson, Missouri theme park, open Wednesdays through Sundays, 10 a.m. – 6 p.m., and 9:30 a.m. – 6 p.m. on Saturdays. Information: 800-831-4FUN(386) or http://www.silverdollarcity.com. 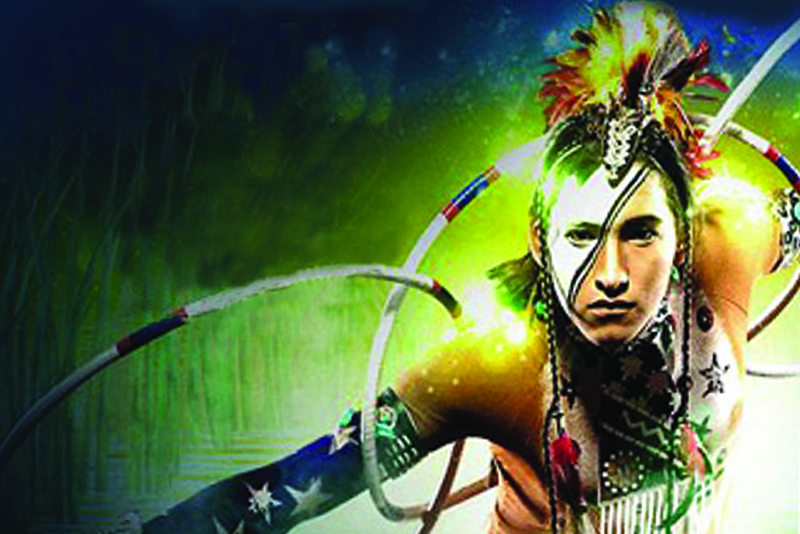 The new Silver Dollar City Wild West Show features 6-time world champion Native American Hoop Dancer Nakotah LaRance. High-action stunts, 3-story falls and pyrotechnics pack the Western stunt show presented during Silver Dollar City's National Harvest & Cowboy Festival. 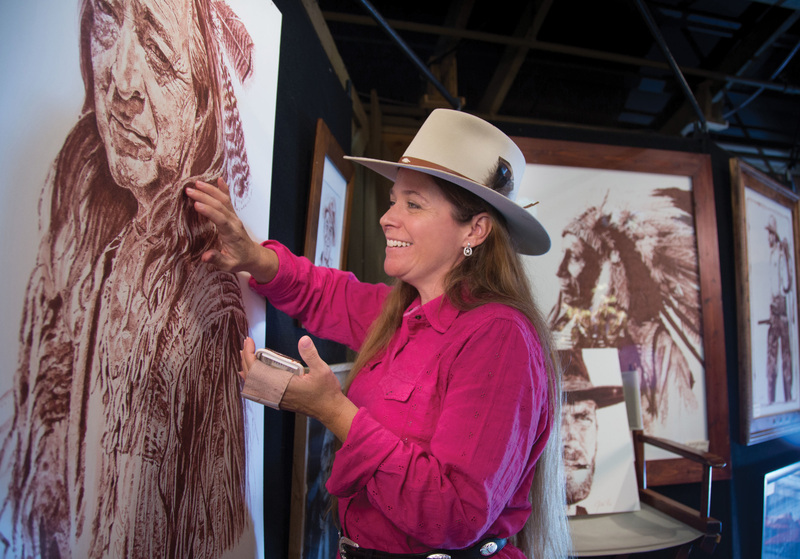 Western touch painting is one of the crafts demonstrated during the National Harvest and Cowboy Festival, featuring 125 visiting artists joining the park's 100 resident craftsmen. Mustang expert Fred Woehl tames and trains rescued wild mustangs during the National Harvest & Cowboy Festival. 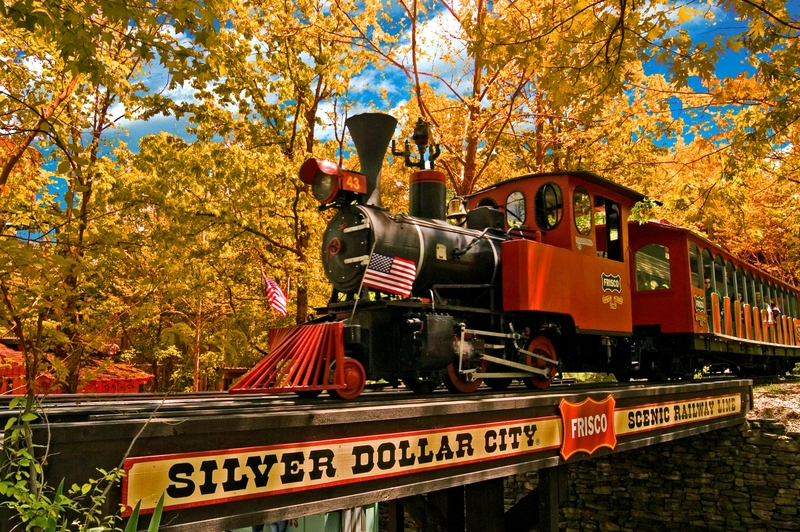 The Silver Dollar City steam train is one of more than 30 rides and attractions at the Branson, Missouri theme park.